When the calculation is completed normally, the following eight files are newly generated in the directory, 'work'. C0.ld2          logarithmic derivatives of wave functions(l=2). In a file, C0.nsvps, the pseudopotentials in a non-separable form are output, in which they are listed in order of log (r), r, the pseudopotential 0, and the pseudopotential 1, ..., where the number referred to specify the pseudopotential corresponds to the number given for the first column in the specification of the keyword, pseudo.NandL, in the input file. All the units employed are in atomic unit. Figure 2 shows the pseudopotentials of a carbon atom stored in the file, C0.nsvps. In a file, C0.vps, the pseudopotentials in a separable form are output, in which they are listed in order of log (r), r, the local part of the pseudopotential, and the non-local part of the pseudopotential. Also, the input file and the results of the SCF calculation are added in this file for your adversaria. The file is output in the flexible data format, since the file *.vps is used for the input file to the program package, OpenMX. In Fig. 2(b) shows the separable pseudopotentials of a carbon atom. In case of charge.pcc.calc=ON, then the file also includes the partial core density for PCC . The format is the same as that of the pseudopotential, and they are listed in order of log (r), r, and the partial core density. The data of the partial core density is also used as the input date of OpenMX. In Fig. 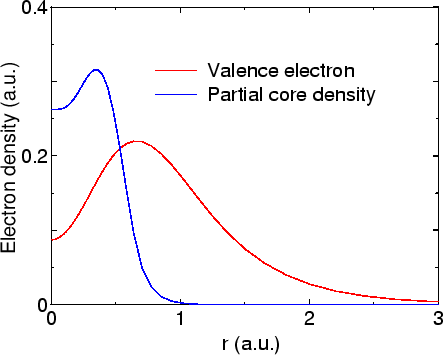 3, the partial core density is shown together with the valence electron density stored in the file, C0.vden. The pseudo-atomic orbitals corresponding to the pseudopotentials are output in a file, C0.vpao. The format of the output is the same as that of C0.nsvps. Figure. 2(a) shows the pseudo-atomic orbitals and the pseudopotentials. The electron density for the valence electron is stored in a file, C0.vden. log(r), r, , , , , , . log(r), r, , , , , , , . 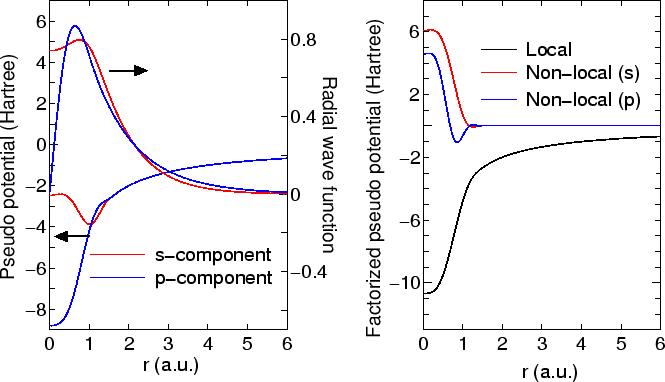 : Modified core electron density for PCC. The local part of separable pseudopotentials is output in the file, C0.loc, in order of log (r), r, and the local part. Figure. 2(b) shows the local part of the pseudopotentials. The logarithmic derivatives of radial wave functions are output in the file, C0.ld*, where * means the angular momentum quantum number. The data are stored in order of energy and the logarithmic derivatives of radial wave functions under the all electron potential, semi-local pseudopotential, and fully separable pseudopotential. Figure: (a) Radial parts of the pseudo-atomic orbitals and the corrsesponding norm-conserving pseudopotentials, (b) Norm-conserving pseudopotentials in a separable form. In the generation of pseudopotentials, it is possible to choose either the BHS type, the TM type, or the MBK type. In the template file, C.inp, the TM type is chosen as the generation scheme. In practice, the choice of a suitable cutoff radius in the pseudopotential generation is made by trial and error so that the shape of the generated pseudopotentials can be smooth. Also, it is required to carefully check whether appropriate results are obtained or not for physical quantities that you want to calculate when density functional calculations are performed for molecules and solids using the generated pseudopotentials. In addition to this, a proper choice of valence states have be checked by a series of benchmark calculations.